Partiers dancing in the streets at Notting Hill Carnival in London paused to observe a minute’s silence in memory of those who died in the Grenfell Tower fire. 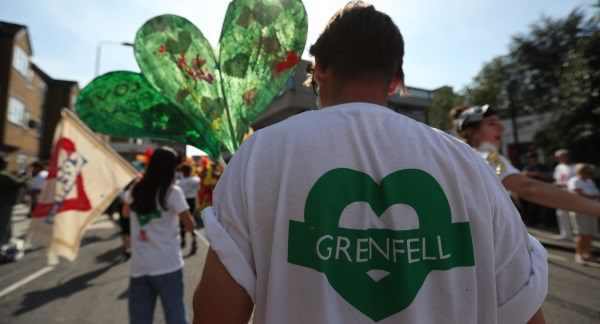 At 3pm today sound systems stopped blaring and the carnival procession paused for 60 seconds to remember the at least 80 victims of the devastating tower block fire. Around half a mile away from the charred high-rise, firefighters lined up, removed their helmets and bowed their heads outside North Kensington fire station. The moment was concluded with a spontaneous round of applause and cheers from the hundreds of thousands of carnivalists celebrating the bank holiday weekend. The firefighters were then embraced, congratulated and thanked by carnival goers, posing for photos with them.